Both France and Italy have earned respect in the world of interior design with exquisite furniture, mirrors, chandeliers and lovely old tapestries. A cruise of the Mediterranean, taking in those beautiful old countries, made my love for antiques and European design grow with a passion. Old World design is a feast for inspiration and offers solutions to everyday design problems. Design trends come and go; often leaving interiors looking dated and tired after only a few months or years. By using antiques and art objects that span centuries and cultures You can incorporate a sense of stability and permanence that will stand up to the test of time. New architecture has been re-formulated and re-combined in novel ways so that modern structures imitate the feeling and ambiance of old world villas, chateaus and historical edifices. Architects and designers have discovered that these new structures are enhanced by using old world plaster techniques, oxidized finishes, trompe l’oeil and stone work that gives instant age and look that makes the home elegant and warm. By using antiques one will further enhance these types of projects with French flair. Avoid those hastily thrown together rooms that can be set up in an afternoon. Create rooms of your dreams by using items of quality that can be found in antique shops and specialty shops. Using antiques can be a winning proposition for both designer and client. The designer gets the credit for finding special one of a kind and unique objects and helps create ambiance that he or she wishes to achieve. The new owners of these treasures have objects that they will enjoy for a very long time and that will retain value. Use your creative energy and find special European antiques and discover the value of old world patinas, inlays, special carvings and other intricate details missing in modern construction. Gathering object d’art and accessories with history will fill your interiors with a special look and charm. Your rooms will never be dull and predictable or become a carbon copy of the masses. When you embark on your quest for fine antiques, I suggest you buy the best you can afford as this will pay off in the long run. Look for classic styles, woods in original condition and pieces that have been lovingly restored. The cabinet makers of the past took months and sometime years to complete their magnificent projects. They often signed their best works in the wood or inscribed their marks in the hardware they applied to their pieces. These pieces are considered to be masterpieces and are highly sought after today. Finding just the right piece can be both a challenge and a pleasure. Put on comfortable walking shoes and enjoy your hunt through antique stores, galleries and antique shows. Heighten your creative abilities and knowledge by stepping into the glorious past. 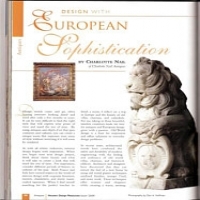 Ignite your future projects with the beauty and romance of Europe.